Sausage Stuffed Acorn Squash - What's In The Pan? Look at all these festive colors and flavors stuffed into a simple stuffed acorn squash! 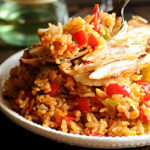 It’s perfect for when you want to warm yourself up with a hearty and healthy meal. Stuffed acorn squash easy to make, so healthy and full of flavor. I used bulk Italian sausage in this stuffed acorn squash recipe and rosemary & dried thyme as my fresh herbs. 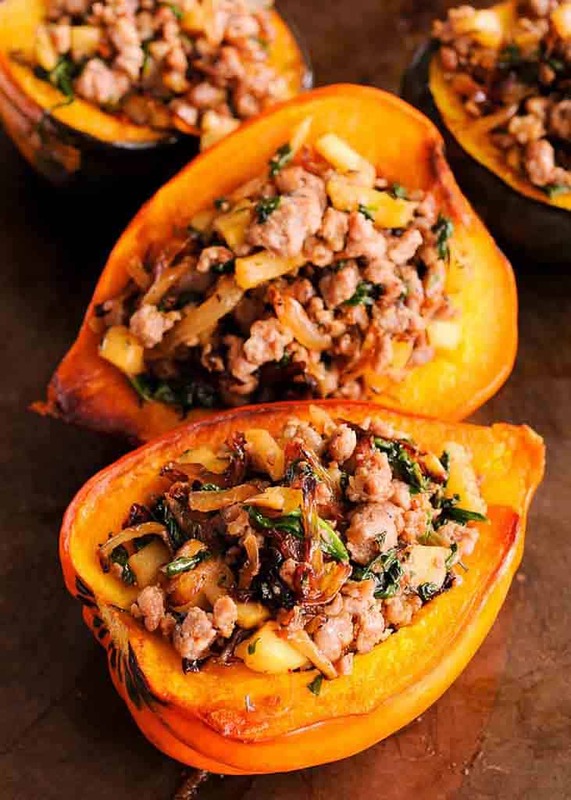 This Whole30 squash recipe has high quality protein, anti-inflammatory olive oil, and tons of nutrients from spinach, apple, squash and caramelized onions. The final product is extremely delicious dinner and honestly the best stuffed squash I have ever had! It stores and heat up beautifully, by the way. We made it while traveling, and even after 2 days in the fridge and 1 full day of travel – stuffed acorn squash was as tasty as before! This stuffed acorn squash recipe uses a hearty winter squash, that is so abundant in the stores during the winter months, but also available year around as far as the squashes go. And if you love spinach – yes, there is spinach here which brings a nice contrast to the sweetness of apples. This stuffed acorn squash recipe is flexible and can be made ahead completely or you can roast your squash a day ahead and stuff it on the day you are planning to eat it or serve it. However it’s very tasty stuffed squash if you make EVERYTHING the same day. 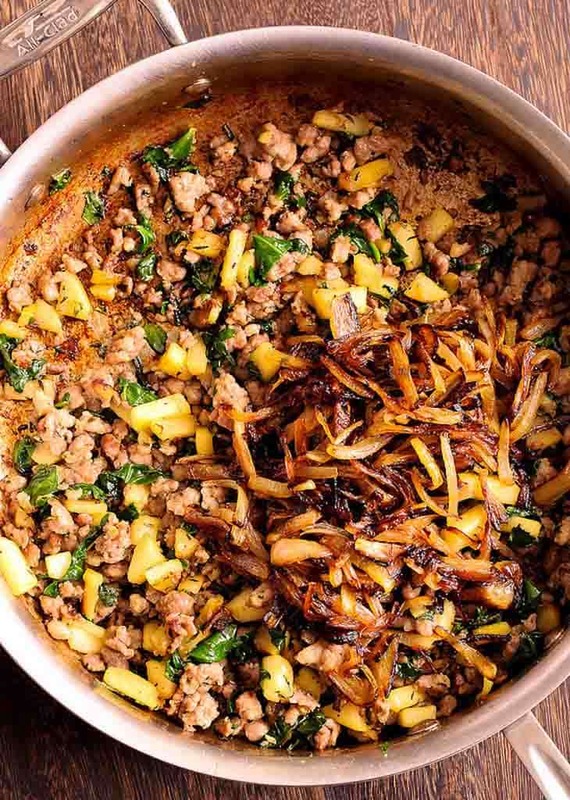 It’s easy enough – you can roast the squash while cooking sausage, apples, spinach and caramelized onions. 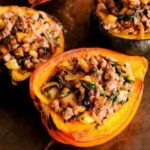 This stuffed squash is a real time saver as far as cooking goes! Roasting acorn squash halves: Preheat your oven to 375 degrees and place the 4 acorn squash halves (seeds removed) open-side down on the baking sheet or skillet. Roast for about 20-30 minutes, or until the top of your squash feels tender when pierced with a fork. Set aside open side up after removing from oven to avoid over*steaming. Caramelizing Onions: Start caramelizing the onions in a medium skillet. Set heat to medium high, add 1 tbsp butter and cook stirring until deep golden brown, about 10 minutes. Add a little bit of water whenever onions start sticking to the pan to much. Remove onions onto a separate plate. 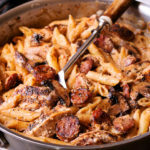 Sausage mixture: Add 1 tbsp butter and minced garlic to the now empty skillet and cook until just tender, then add all the sausage and increase the heat to medium. Cook the sausage and stir to break up lumps, about 5-8 minutes until browned. Add the apples and herbs and continue to cook, stirring until the apples soften. Add the spinach and cook, stirring, until the spinach wilts. Salt and pepper the mixture, taste it and adjust seasoning. Add the caramelized onions to the sausage mixture, leaving excess cooking fat in the pan. Preheat your broiler and fill four halves of the squash with the stuffing mixture. Arrange the squash on the baking sheet, stuffing side up, and put under the broiler for 5 minutes until the tops get browned and crispy. Be careful not to over-burn. 5 minutes should be enough, but some broilers can be unpredictable. 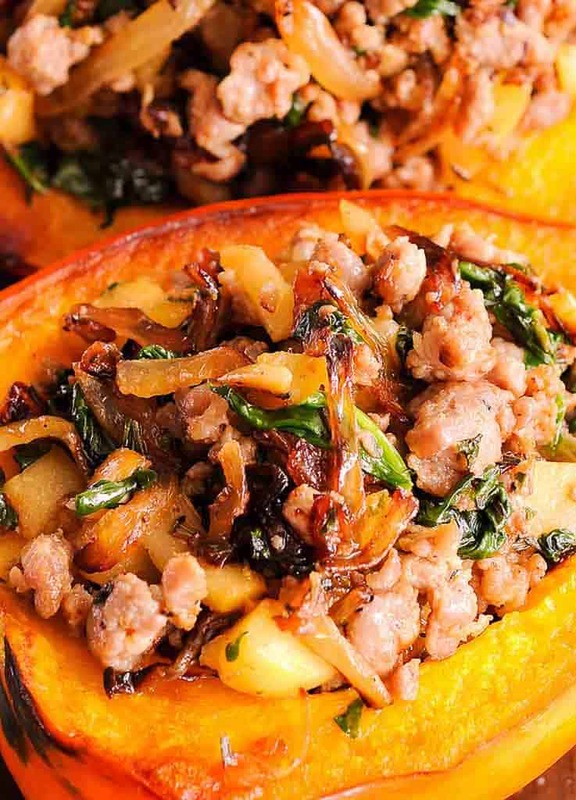 This apple and sausage stuffed squash with spinach and caramelized onions can be a new healthy addition to your menu! Roasting squash halves: Preheat your oven to 375 degrees and place the 4 acorn squash halves (seeds removed) open-side down on the baking sheet or skillet. Roast for about 20-30 minutes, or until the top of your squash feels tender when pierced with a fork. Set aside open side up after removing from oven to avoid over*steaming. Caramelizing Onions: Begin by caramelizing the onions in a medium skillet. Set heat to medium high, add 1 tbsp butter and cook stirring until deep golden brown, about 10 minutes. Add a little bit of water whenever onions start sticking to the pan to much. Remove onions onto a separate plate. 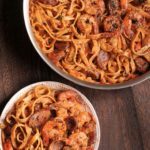 Sausage mixture: To the now empty skillet add 1 more tbsp butter and minced garlic and cook until just tender, then add all the sausage and increase the heat to medium. Cook the sausage and stir to break up lumps, about 5-8 minutes until browned. Add the apples and herbs and continue to cook, stirring until the apples soften. Add the spinach and cook, stirring, until the spinach wilts. Salt and pepper the mixture, taste it and adjust seasoning. Broiling: Add the caramelized onions to the sausage mixture, leaving excess cooking fat in the pan. Preheat your broiler and fill four halves of the squash with the stuffing mixture. Arrange the squash on the baking sheet, stuffing side up, and put under the broiler for 5 minutes until the tops get browned and crispy. Be careful not to over-burn. 5 minutes should be enough, but some broilers can be unpredictable. Alternative to broiling: If unsure how to use the broiler, just put it in the oven at 400 F for 10 minutes to reheat. I made these with caramelized shallots – just beautiful! Great flavor too. 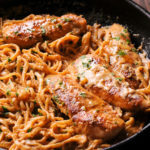 I love cooking with shallots as well!